OXFORD, Miss. 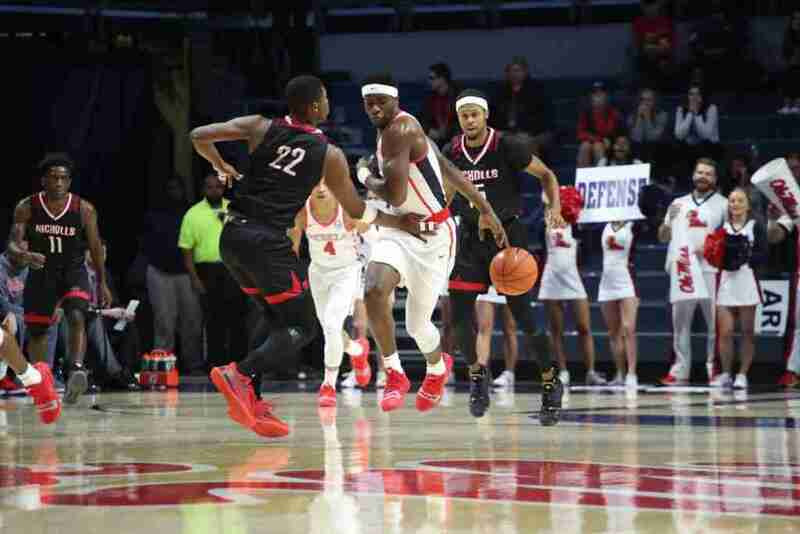 — The Ole Miss men’s basketball team, now 2-1 overall, hit the court in The Pavilion Tuesday night and easily handled an athletic Nicholls team, 75-55. The Rebels entered the contest fresh off a solid performance, albeit a tough loss, to the Butler Bulldogs Friday night in Indianapolis. In that game, senior Terence Davis knocked down 30 points, his fourth game with at least that many, and kept Ole Miss close with the Bulldogs down the stretch—while also putting himself in the lead in the SEC with an average of 23.5 points per game (ppg). In Tuesday night’s contest against Nicholls, Davis racked up an impressive 14 points and 8 rebounds in front of an energetic home crowd. Nicholls (2-4), coming off a brutal 81-54 loss to Baylor, entered the contest having played three more games than the Rebels. The Colonels’ trip to Oxford marked the fifth straight game Nicholls has played on the road in this young season, and they brought with them two returning starters from the 2017-2018 team that shared a piece of the Southland Conference title. 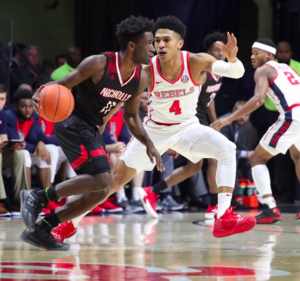 Against the Rebels, Nicholls grad transfer Jeremiah Jefferson, who led the league with 19.8 ppg going into the game with Ole Miss, experienced a disappointing night as he left the floor with just 7 points. The Rebels are now 9-0 against Nicholls in the all-time series dating back to the 1988 basketball season. The Rebels sprinted out to a 9-2 lead in the first two minutes of the game by moving the ball around to four different scorers. 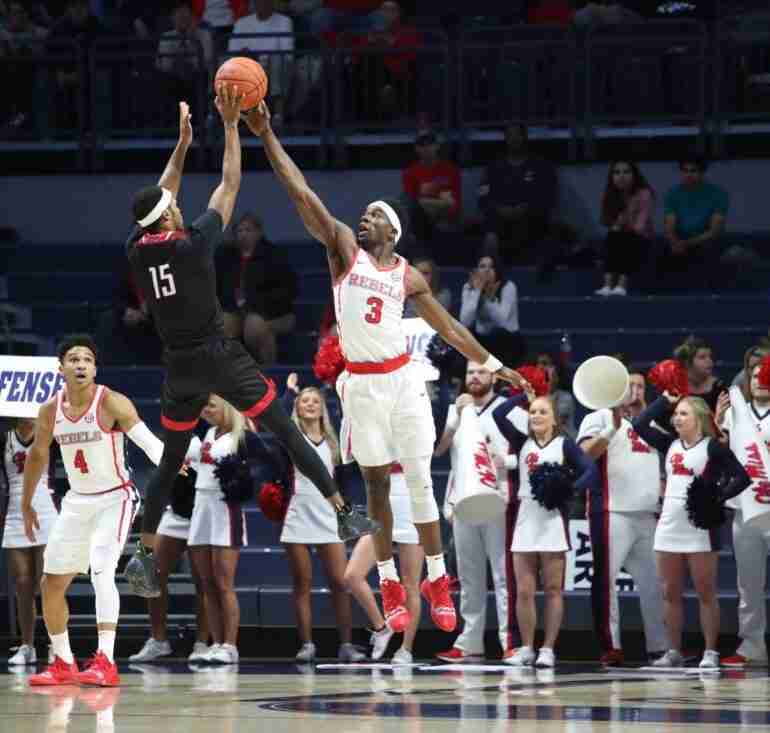 Ole Miss pushed the lead to 11-4; however, the Colonels narrowed the lead to two points, forcing Ole Miss head coach Coach Kermit Davis to call timeout. Following the timeout, Ole Miss pushed the lead back to 8 points as the clock hit the under-eight media timeout. At this point, the Rebs’ defense had forced 8 turnovers in 13 minutes—and off those turnovers, they were able to pick up 8 points. The Ole Miss defensive stands continued as they forced Nicholls into a near six-minute scoring drought that saw the Colonels go 1 of 12 from the field to end the half with a 14-point deficit, trailing the Rebels 37-22. At the midway point, junior guard Breein Tyree led the way for Ole Miss with 8 points, while seven other Rebels had contributed for Coach Davis’ team. Picking up where it left off, the Ole Miss defense came out after halftime and immediately forced a Nicholls turnover that resulted in a Blake Hinson 3-pointer, putting the Rebels up by18 points, 40-22. After a six-point run, Ole Miss pushed the lead to 21 points, forcing the Colonels to call timeout. The timeout proved futile for Nicholls as the Rebs were able to hold the lead for the remainder of the contest. While Ole Miss looks to be playing fundamentally-sound basketball, especially on the defensive side of the court where the Rebels notched an impressive 36 to 21 advantage on defensive rebounds, the story of the game for the home team has to be the incredible unselfishness on the offensive side of the ball. The final box score showed eight Rebels in the scoring column, emphasizing the brand of basketball Kermit Davis is bringing to the Ole Miss program. Even though there was great balance for the Ole Miss offense, it was still Terence Davis, the senior out of Southaven, who was most impressive for the Rebels. He finished the game with 14 points, 8 rebounds, 3 assists, and a career-high 4 blocks, playing a key role in leading Ole Miss to its second home victory in as many tries. The Rebels held Nicholls to only 55 points, their best defensive performance since limiting Bradley to 49 points (Dec. 19, 2016) 60 games ago. Ole Miss altered the starting lineup for the first time this season, going with Devontae Shuler, Breein Tyree, Terence Davis, Blake Hinson and Bruce Stevens. Terence Davis, the leading scorer in the SEC (23.5 ppg), led Ole Miss in points for the third straight game with 14. In doing so, Davis passed Jason Harrison (1,066 points) and is now tied with Coolidge Ball at No. 34 on the Ole Miss all-time scoring list (1,072 career points). Entering the game ranked fourth in the SEC with 2.5 steals per game, Devontae Shuler picked up a pair of steals in the first four minutes of the contest. He ended the night with three steals and dished out a career-high six assists. During the first half, Ole Miss held Nicholls to a pair of five-minute scoring droughts to build a 15-point halftime lead. Terence Davis recorded a career-high four blocks and limited Jeremiah Johnson to seven points on 3 of 13 shooting (1 of 7 from three-point range). Johnson entered the matchup as the leading scorer in the Southland Conference at 19.8 ppg. Breein Tyree tallied 10 points, his ninth straight game in double figures dating back to last season. Freshman Blake Hinson started for the third straight game and scored a career-high eight points. The Rebels improved to 2-0 in The Pavilion under Kermit Davis.